As many of my readers know, there are two things I adore: DIY projects and cameras. 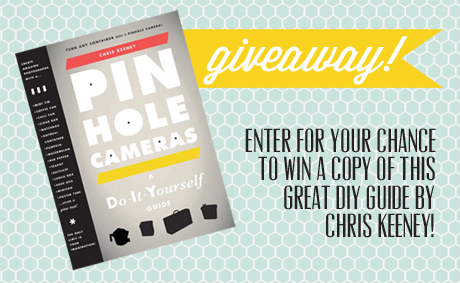 This book, Pinhole Cameras: A Do-It-Yourself Guide by Chris Keeney is right up my alley — and hopefully yours as well! It's filled with lots of great projects and tips for creating your very own pinhole cameras and creating wonderful dream-like images. Use the widget to enter for you chance to win. Remember that this giveaway is world-wide! Only entries which are submitted through this widget will be counted. There are six easy ways to enter! Don't delay — this giveaway on October 9th.